Released on: October 21st, 2014. This set combines an interesting array of Price's films. Two long abused public domain titles are finally afforded decent transfers (THE LAST MAN ON EARTH and THE HOUSE ON HAUNTED HILL), two of Price's better known sequels are given HD upgrades (DR. PHIBES RISES AGAIN! and THE RETURN OF THE FLY) and to round it off we get three missing pieces of the Poe cycle on Blu - THE RAVEN, THE COMEDY OF TERRORS and the most underrated entry in the series - THE TOMB OF LIGEIA. 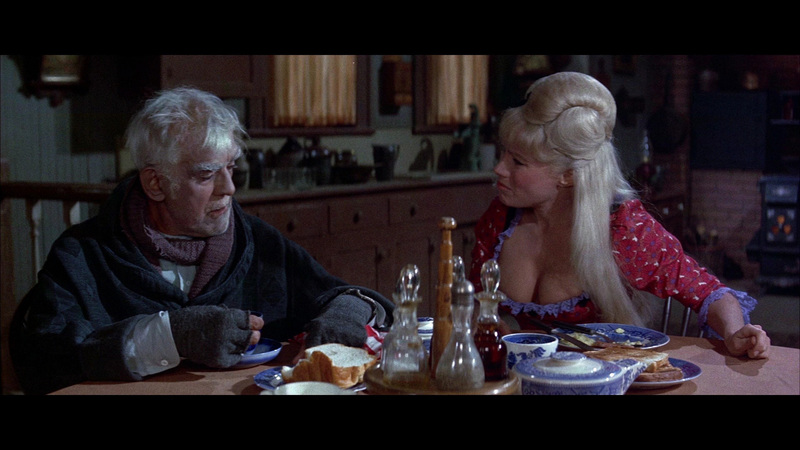 But yet, THE RAVEN is one of the disappointments of the Corman Poe canon. The problem with THE RAVEN is that a lot of it simply isn't that funny. Since Poe's poem is relegated to the status of being plundered for a few lines here and there, a certain amount of blame must fall on Richard Matheson's slightly saggy script. Price - in an offbeat good-guy role - is also treading yet again on the "guy with a dead wife he just can't get over" plantation. 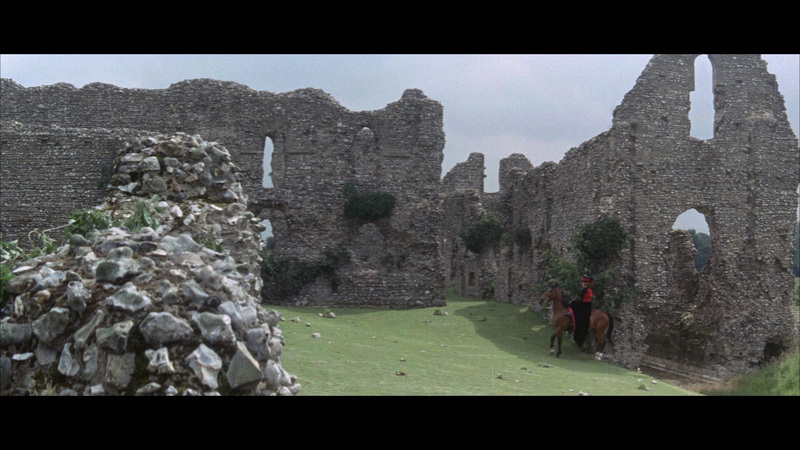 The sets look lovely but aren't as impressive as the likes of THE MASQUE OF THE RED DEATH. Karloff's rival sorcerer is a cool character even if a bit tamped down. Lorre runs slightly riot in the film, which is usually fine, but when he's out of tune with the material he creates an annoying presence. The final showdown of the film is quite clever and a definite highlight but can't really save the movie. 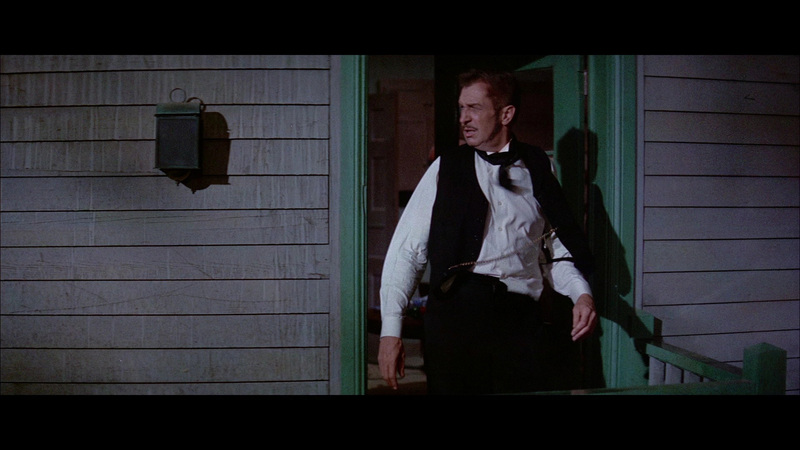 Then there's the issue of Les Baxter's dreadful score. Filled with bizarre musical outbursts it often turns the tone of the film into a loud and obvious slapstick comedy. What is up with that tuba? Why Scream chose to kick off this set with the weakest film in it is a bit of a mystery. Next up we have a marked improvement in the comedic area. 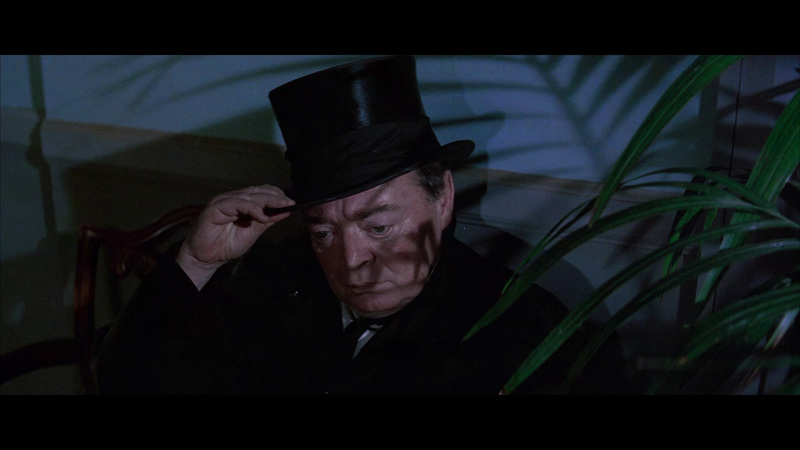 THE COMEDY OF TERRORS (1080p 2.35:1 AVC encoded) outstrips its rival on disc one in this set by first being actually funny. The other plus is the use of the great Jacques Tourneur in the directing chair. 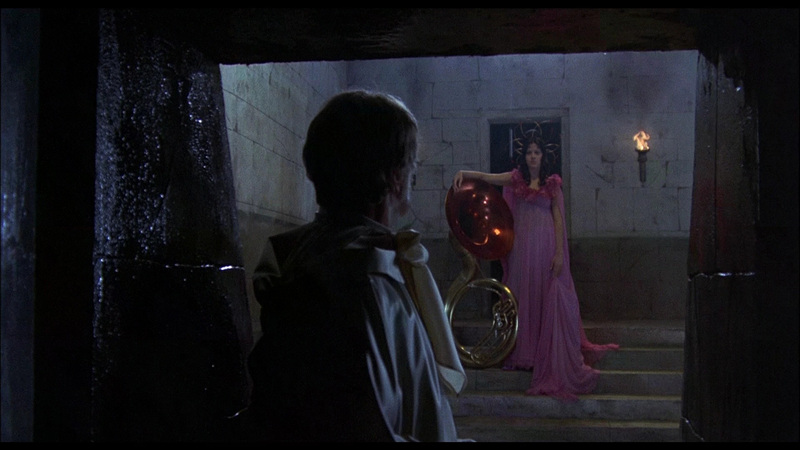 As good a director as Corman could be, he did sometimes slip into a predictable functionality behind the lens. 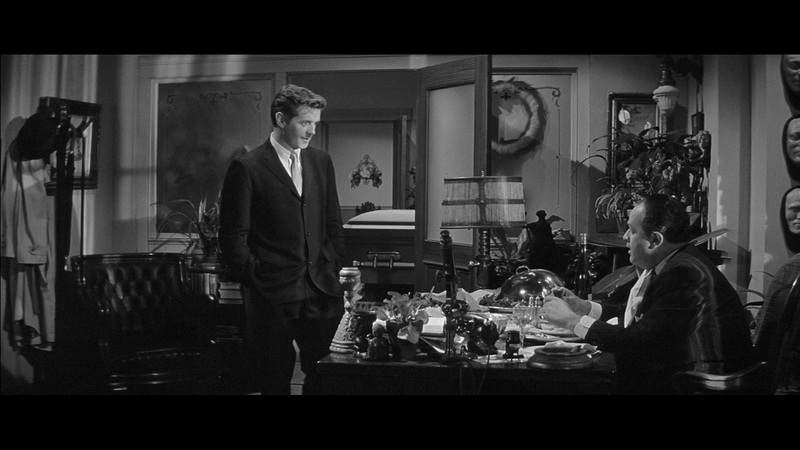 Tourneur shakes things up and he has a better script to work with. 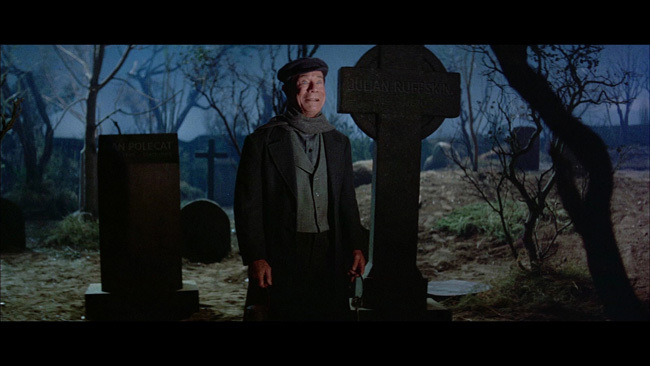 Price plays an undertaker named Waldo drowning in debt and forced to come up with a plan to pay off the landlord he is in hock to (Basil Rathbone). With the help of his sleazy assistant Felix (Peter Lorre channeling a simpleton) Price and Lorre concoct a plan to provide fresh bodies to keep the business busy. 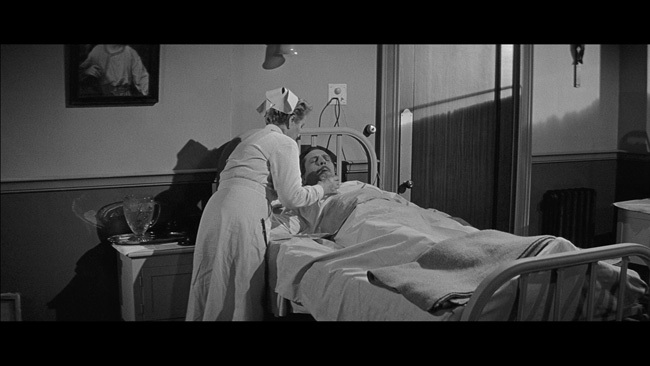 Some of the funniest parts of THE COMEDY OF TERRORS revolve around Price's wife in the film - Amaryllis (Joyce Jameson). A pretty lush, she ends up attracting the amorous affections of the toad-like Lorre to some quite amusing ends. 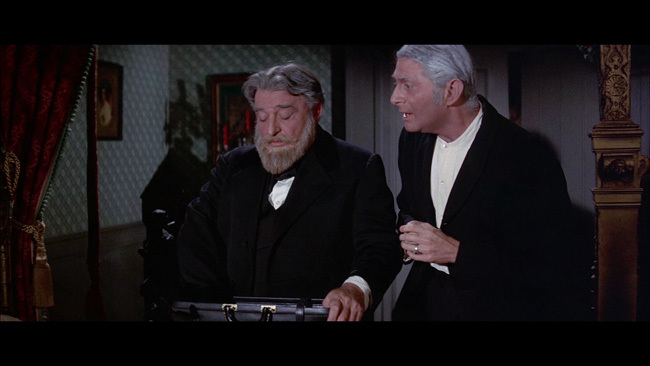 Her father - played by a hilarious Karloff as a bizarre narcoleptic - is a constant source of irritation to which Price would love to find a permanent solution. The script is filled with gloriously overwrought language that adds immensely to the absurdity of the film. Matheson gives his cast the kind of OTT pomposity that plays perfectly coming out of the mouths of the likes of Rathbone and Price. This one also features a rare appropriate Les Baxter score that is playful without being abusively obvious. This one's a winner. 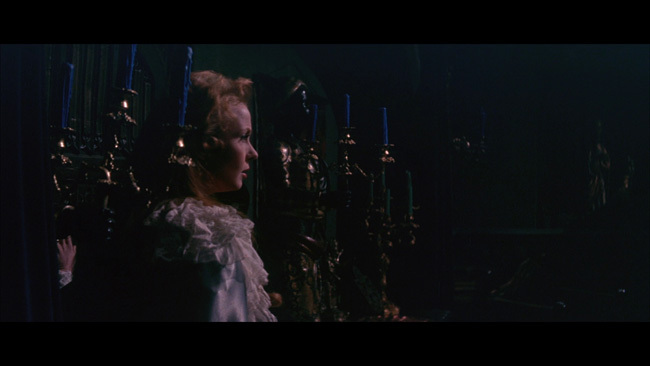 Moving on to disc two we reconvene with what remains the overlooked gem of the Poe/Corman group - THE TOMB OF LIGEA (1080p 2.35:1 AVC encoded). The last of these Poe projects for Corman takes a markedly different approach in a few key areas. It utilizes a fair amount of location shooting for one thing - which at this point was desperately needed to break away from the previously setbound productions that had slipped into a bit of a rut. Verden Fell (Price) is yet another gothic tragic figure who has lost his wife and lives in a castle (hasn't Vincent learned to stay away from the altar at this point?). 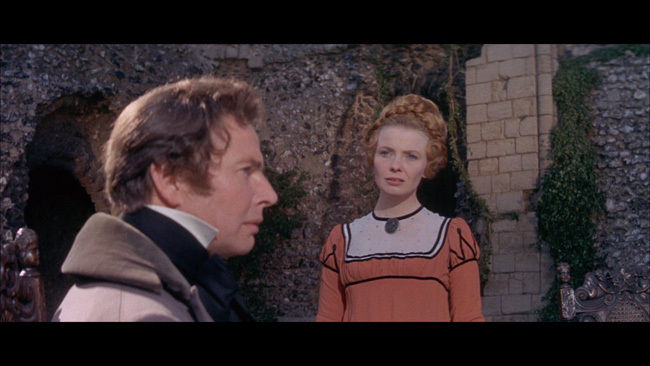 Out riding one day on his estate he encounters the lovely and much younger Lady Rowena (Elizabeth Shepherd in a dual role as Ligea and Rowena). Being a dead ringer for the dead wife he is obsessed with (whose tomb is his favorite place to visit), Fell is almost instantly smitten with the doppelgänger. After a quick marriage and honeymoon the pair return to the decaying mansion and terrible things begin happening. 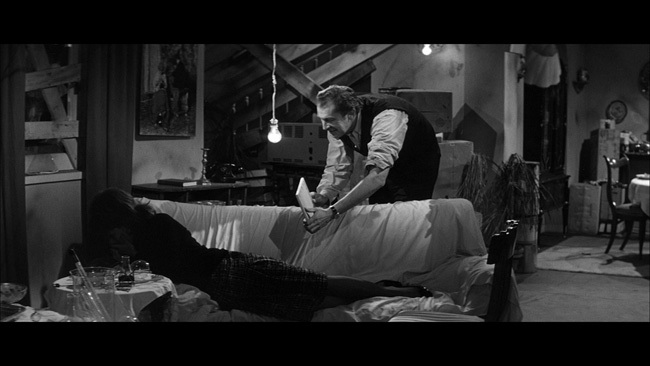 While the setup is basic (dead wife haunts new wife and takes the form of a sinister animal - in this case a cat), the location shooting and Price's unusually sensitive performance help elevate this one above the routine and give it some distinctive flavor. Fell suffers from a bizarre medical condition that forces him to wear outsize goggle sized glasses but somehow Price manages to make this into a tragic affliction as opposed to a campy one. Price avoids the hammy at every turn and it really helps the film. The climax is well rendered with an ex-love interest of Rowena and one of Fell's servants trying to unravel the mystery. 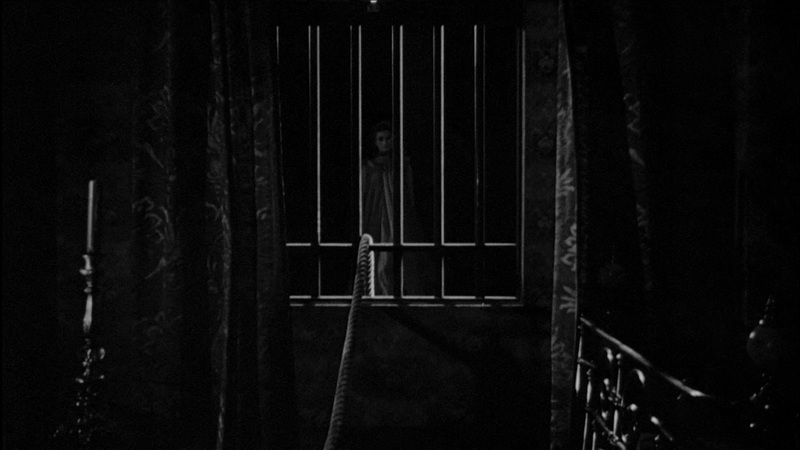 The film also features a few genuinely scary scenes. Disc two continues with one of the more interesting films in the set. The Italian-American coproduction THE LAST MAN ON EARTH (black and white 1080p 2.35:1 AVC encoded) is a perfect example of a film long overdue for a serious reappraisal. An ostensible adaptation of Richard Matheson's "I Am Legend" novel it has always been regarded as one of the red-headed stepchildren of the Price filmography. In light of the later adaptations (the wildly entertaining THE OMEGA MAN and the risible Will Smith vehicle) it appears that THE LAST MAN ON EARTH actually hews the closest in spirit and look to the source novel. 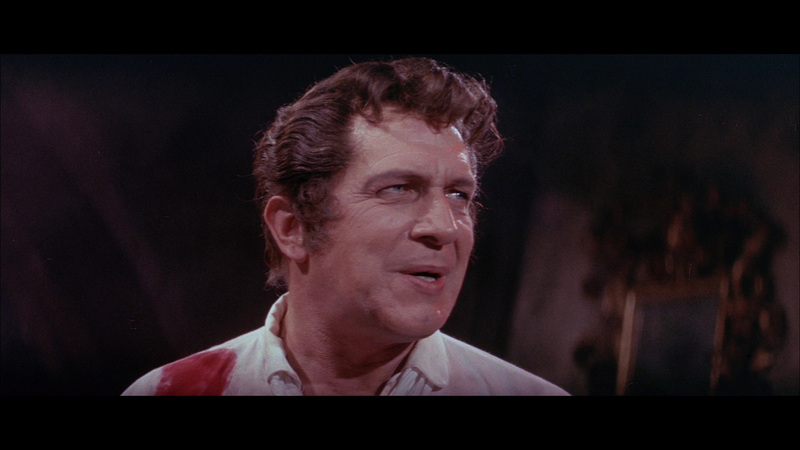 Price has been wrongly long considered miscast in the role of avenging survivor Robert Morgan in the movie. Morgan is living in a post-apocalyptic nightmare world where mutant zombie/vampire like creatures come out in force to try to kill him at night. 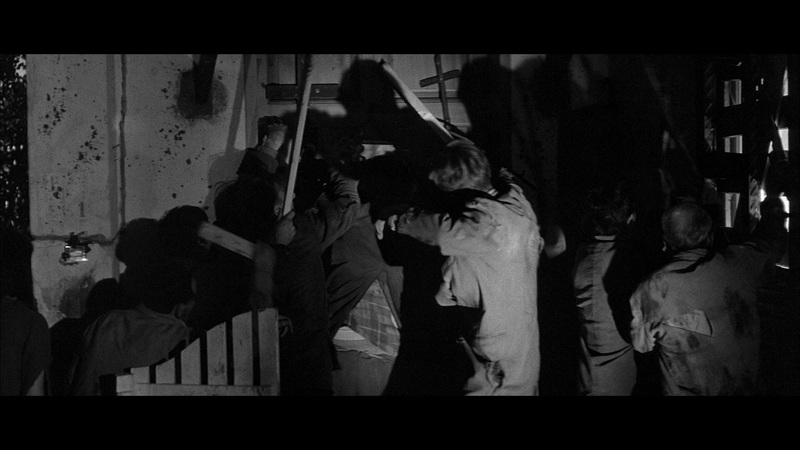 The ties to vampirism are blatant with the use of garlic cloves to protect him in his boarded up home fortress. Price has to deliver a lot of narration in the beginning of the film as he details the past apocalypse and his fascinating daily routine. He goes on hunting missions to kill the mutants by day and there is a lot of powerful imagery on display. Price in a gas mask hurling corpses into a flame pit is one. Eventually a woman comes on the scene that is infected but yet still mostly human. Can she be the key to a cure? Or is she just a plant sent by the subhumans to gain entry into the Morgan home fortress so they can eventually destroy him? 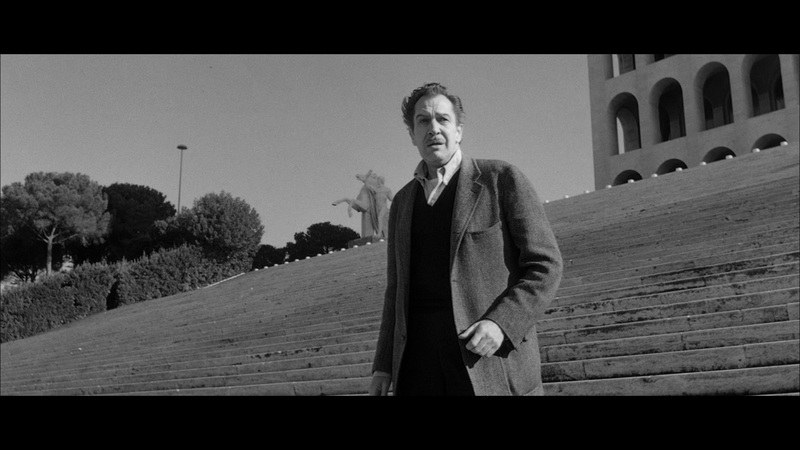 Though shot in Italy, American director Sidney Salkow manages to create an ambiguous enough looking city that it isn't TOO obvious that this wasn't shot in the USA. What remains a mystery is why Price was considered miscast. While the actor certainly could deliver the ham and the camp, this, along with his stellar turn in the brilliant WITCHFINDER GENERAL, is one of Price's most understated and controlled performances. He's got the world weary bit down pat. The anger is there but tightly controlled. He's perfect really. 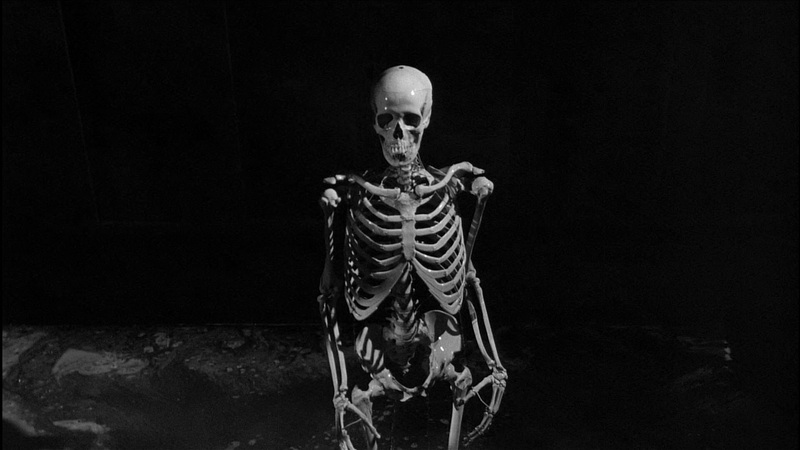 The movie itself is extremely well-shot with a frankly creepy black and white ethos that links it positively with films like NIGHT OF THE LIVING DEAD and CARNIVAL OF SOULS. Seeing THE LAST MAN ON EARTH, at long last, properly framed and in HD is a treat. 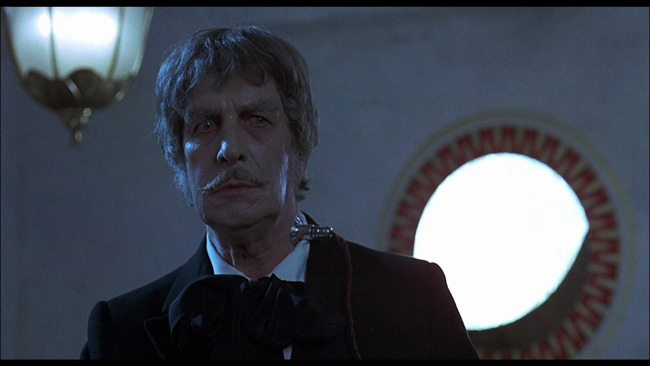 Disc 3 features two of Price's strong sequel outings commencing with DR. PHIBES RISES AGAIN (1080p 1.85:1 AVC encoded) Three years after the first film, Phibes/Vincent is at it again. Having successfully broken free of the "death trance" he's back for more revenge shenanigans. 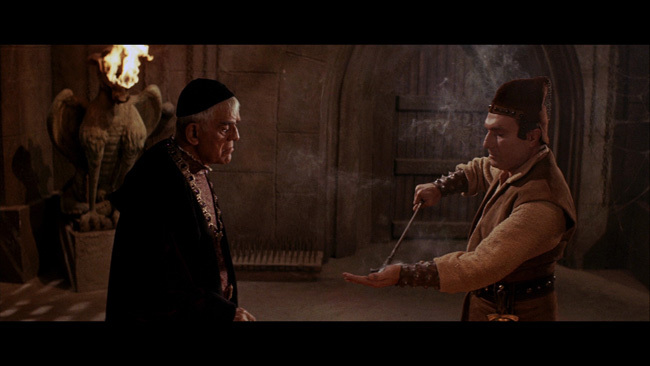 With the aid of assistant Vulnavia (Valli Kemp), Phibes endeavors to locate the fabled Egyptian river of life that can restore his wife (Caroline Munro) from her current state of suspended animation. He's got a few problems though. Firstly, there's the matter of scientist Biederbeck (Robert Quarry) who has stolen some essential scrolls from Phibes and is also on the hunt for the River Of Life. 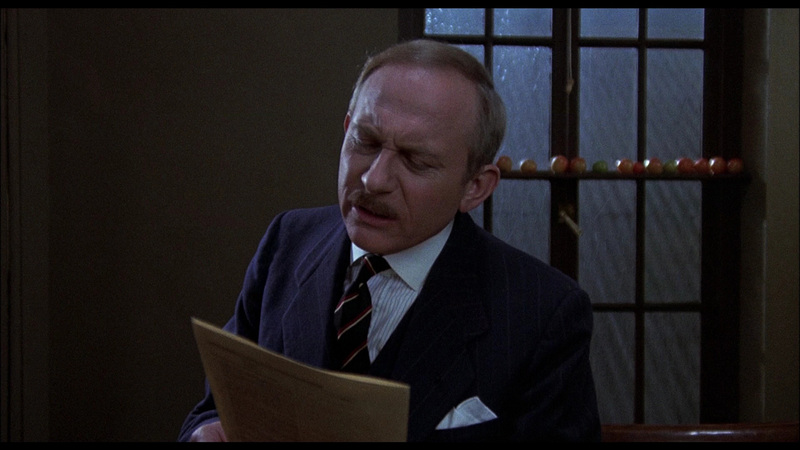 There's also an annoying police inspector with the ridiculous name of Trout (Peter Jeffrey) to get rid of. The PHIBES films have always been great examples of Price in the kind of hammy performances that actually work. 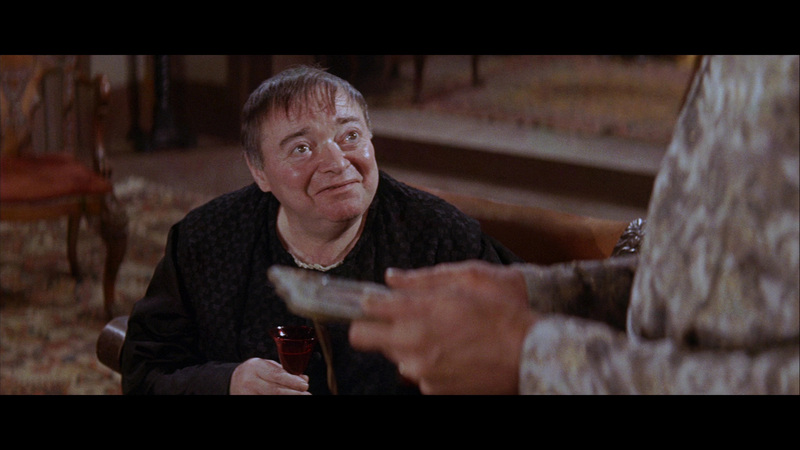 He's gloriously silly in most of the film but a hoot to watch. He's also got some able support from Quarry who does terrific work in his scenes. 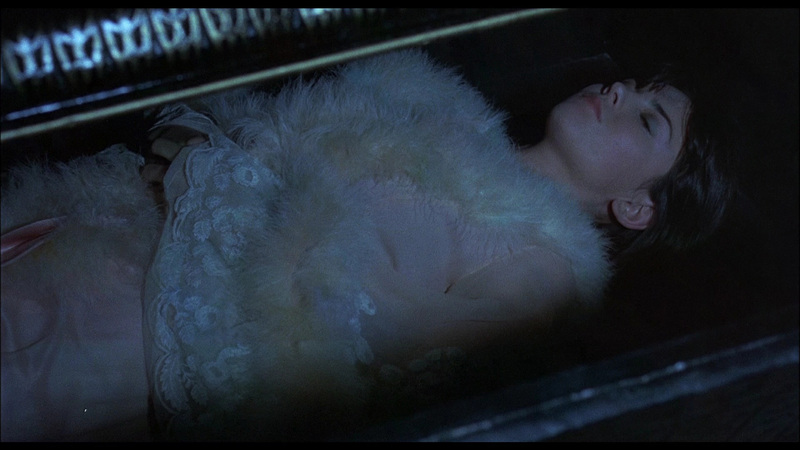 The costumes and murder sequences deliver the goods as well. 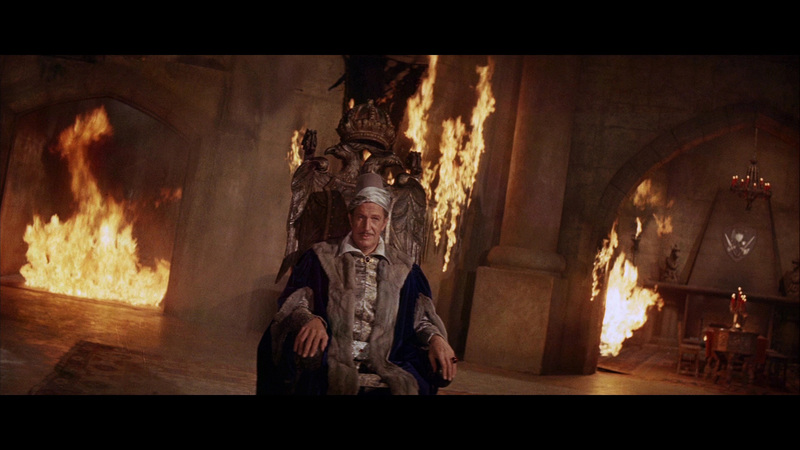 And yes that IS Peter Cushing you saw in a small role. While much like the next film in this set this is an "inferior" sequel it is still a remarkably enjoyable film. Next is another underrated one. 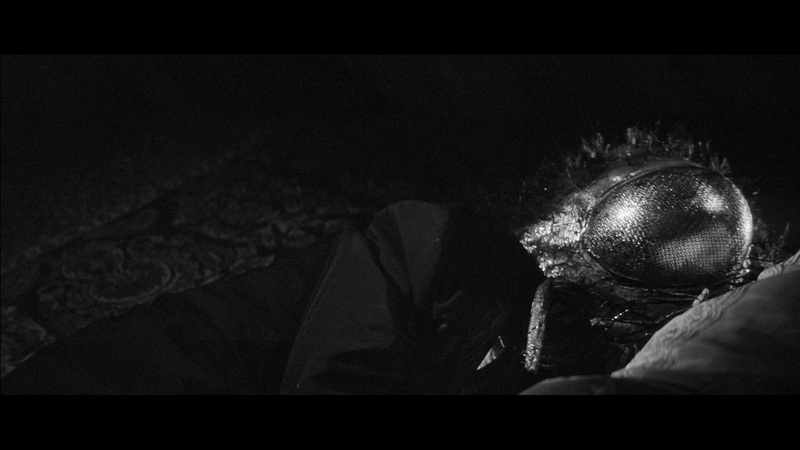 THE RETURN OF THE FLY (1080p 2.35:1 AVC encoded black and white) had the smell of a cheap cash-in on it from the start. While the original was actually a finely tuned melodrama with Price in a supporting role and shot in lush color, 1959's sequel is shot in cost-cutting black and white with inferior fly-head fx and little of the aura of romantic tragedy of the first. But with Price now bumped up to lead status, and a juicy B-movie plot in tow, THE RETURN OF THE FLY becomes a nifty monster movie. 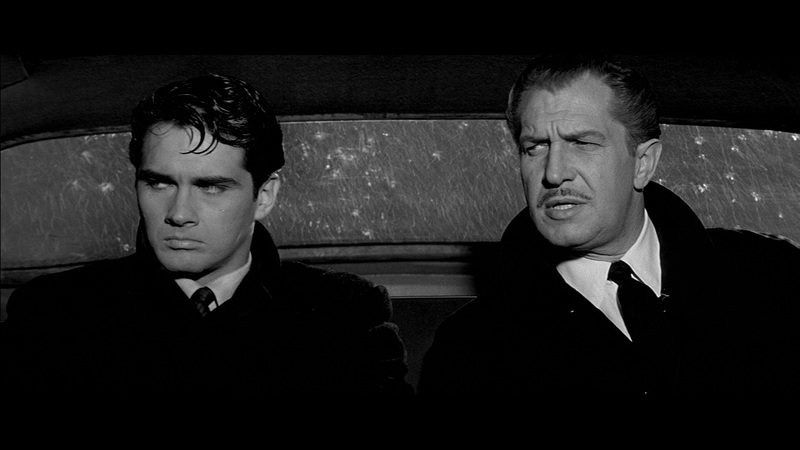 Price reprises his role of Francois Delambre from the first film and is now working with his brilliant young adult nephew Philippe (a terrific early performance by Brett Halsey). The family business remains successful but Philippe has never been told of his father's tragic experiments. Now with his mother's death, Philippe wants answers. Once he finds out the truth, he blackmails his uncle into bankrolling the continuation of his father's experiments in the teleportation field. While RETURN OF THE FLY takes a while to get going, once Halsey starts turning into that thing that avoids sticky paper the movie finds a nice B-movie horror/sci-fi groove. This one is more of a classic 50's monster movie setup with the title creature committing a few stylish and well-shot murders. There's also a fairly clever industrial espionage angle with a duplicitous assistant that actually fits into the plot quite well. Price is on the restrained side but solid and Halsey has a serious quality that lends some gravitas to his ambitious young man. The new fly creature design is ludicrous but fun - the head is a massive construction that looks goofy as hell. Then there's the new "fly leg" that makes Halsey lumber like a drunk as he escapes. He's so freaking slow his pursuers must be cripples! This one is loads of fun. 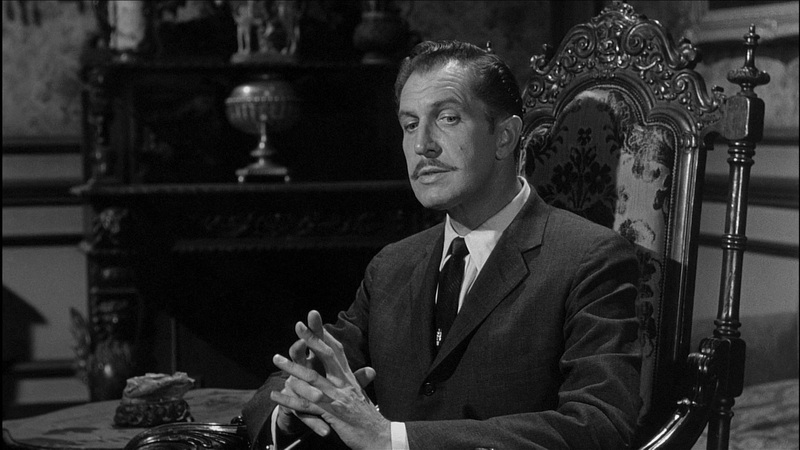 On the final disc the set winds down with William Castle's THE HOUSE ON HAUNTED HILL (1080p 1.78:1 AVC encoded black and white). To be perfectly blunt, Castle was always a far better promotional huckster than he ever was a director but this is one of his strongest efforts. 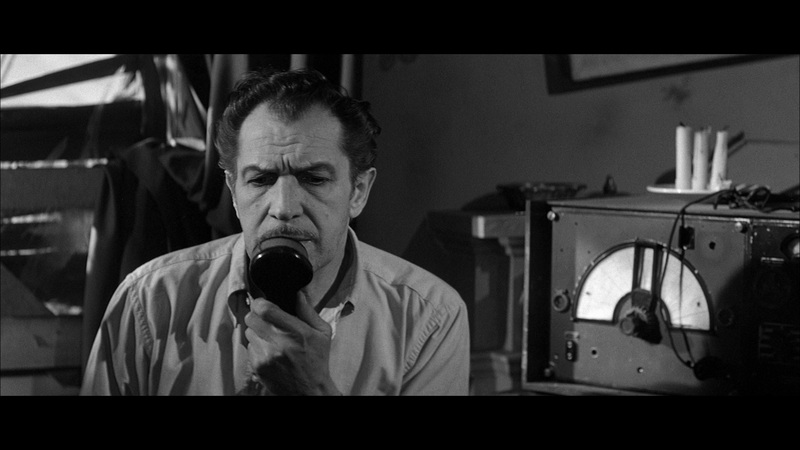 It's not quite up to MR. SARDONICUS' level but it has a first rate cast and a hoary but effective premise. Price is elegant and well-spoken creep Frederick Loren who is in a relationship with a cheating (but at least she's alive!) sociopathic wife named Annabelle (Carol Ohmart). The film opens with them (after a neat prolog with the disembodied head of the mighty Elisha Cook Jr. giving the audience a warning) having a deliciously nasty spat where they roundly insult each other in highfalutin language. Right off the bat it is clear we are going to have some fun with this one. Loren has invited five people to spend the night in a haunted house where a series of murders occurred. The prize is $10,000 for those that survive the night. The kicker? Everyone gets a pistol at midnight and after that the doors get locked with no means of escape at all. So it's hang in to the bitter end. Of course everything isn't what it seems and nobody trusts anybody. 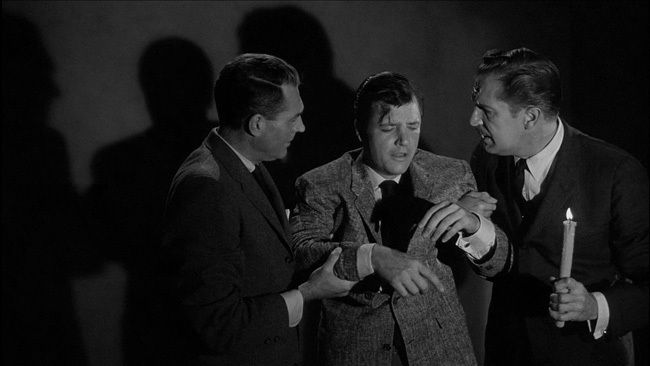 Of the group trapped in the house, Elisha Cook Jr. as the owner of the house and Richard Long as a pilot named Lance make the strongest impression but overall this is the Price and Ohmart show. They have fantastic bitchy chemistry and work beautifully together. 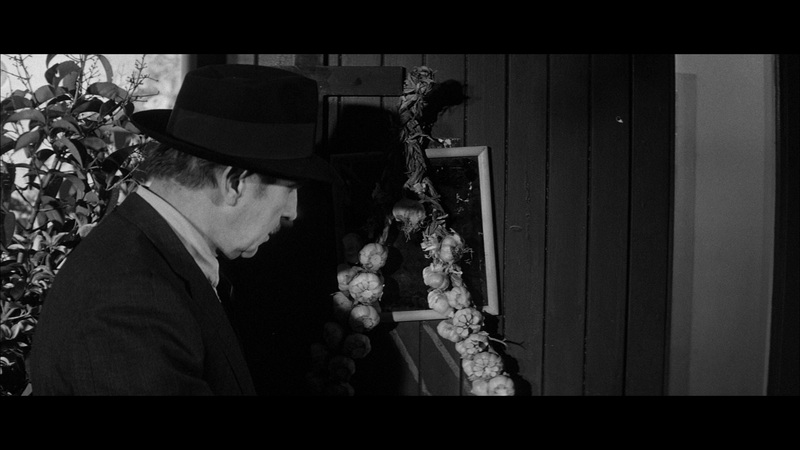 The house itself is a great force in the film and the crisp but moody black and white cinematography exploits it well. While the film can be slightly predictable, if it is taken on its own terms it works very well. The fact that it finally has a decent transfer helps enormously. 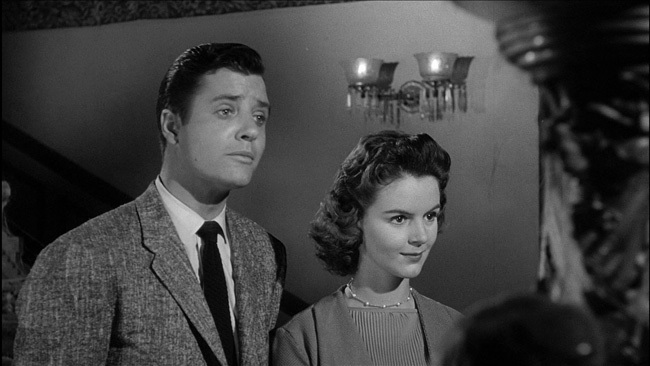 THE HOUSE ON HAUNTED HILL has long been sadly trashed in inferior public domain versions. Overall, Scream have done a solid job on these transfers. LIGEA features a significant detail boost but shows some mild color fading that may not be noticeable to all but the most eagle-eyed/or very familiar with the film. LAST MAN ON EARTH and THE HOUSE ON HAUNTED HILL are both a lovely surprise due to their long history of being abused in cheap public domain releases. In the case of LAST MAN however, there is some print damage visible. While not severe it is present. HAUNTED HILL has even more minimal damage and is frankly the biggest "leap" in the set. Compared to previous versions it is a revelation. 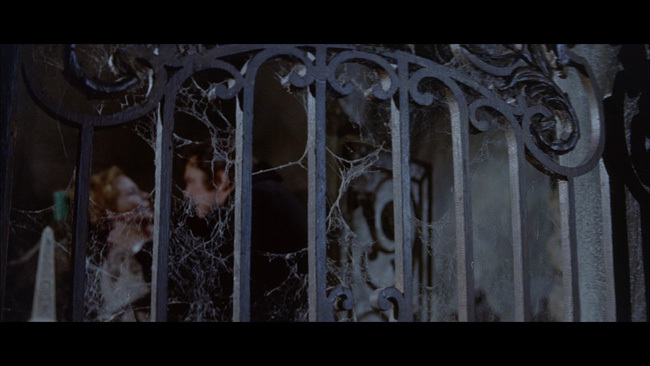 COMEDY OF TERRORS and PHIBES RISES AGAIN probably have the set's best overall color reproduction while THE RAVEN has a evidence of some VERY slight color fade. RETURN OF THE FLY rests comfortably in the realm of a solid black and white HD upgrade.The kind of problems that drive Blu ray enthusiasts to drink are not in evidence anywhere on this set - DNR and sharpening tools, improperly managed grain fields, scanner noise or edge enhancement. Some light crush pops up on occasion in the black and white titles, but never to a serious degree. On video, this set rates a strong 4 out of 5. Let's make this quick. The true to the source DTS-HD Mono mixes that Scream have provided for all of these sets have no inherent flaws other than the kind of limited dynamics available at the time they were recorded. Hiss, distortion, improper leveling and inaudible dialog are not present on any of these. In addition, Scream have provided English subs for every film in the set. The set has a great deal of extra material and the easiest way to handle that is to break it up into categories. 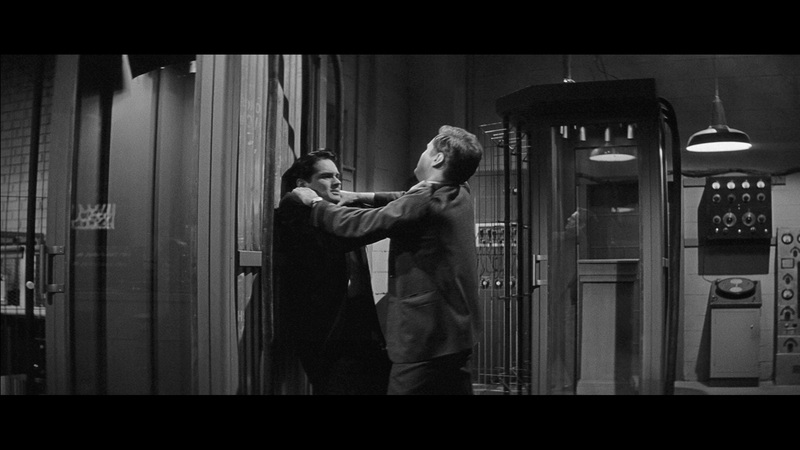 The first and most ubiquitous category is the audio commentary. 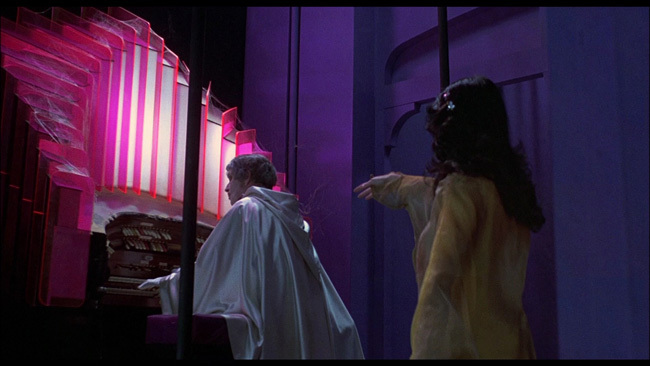 While DR. PHIBES RISES AGAIN and THE COMEDY OF TERRORS lack commentaries, the rest of the films have them - and some have multiple commentaries. Of the historical commentary tracks, Steve Haberman does an excellent job on his tracks for THE RAVEN and especially THE HOUSE ON HAUNTED HILL. Haberman hits his marks well with lots of information about the productions and the actors. These tracks are scholarly but never dull. Constantine Nasr works in a similar vein for his LIGEA track and is also quite informative on that production. He has some interesting things to say about the themes and motifs in the film and provides some biographical info on Edgar Allen Poe. The most problematical of the historical commentaries is the David Del Valle/Derek Bothelo track for THE LAST MAN ON EARTH. Del Valle is lively and always a welcome presence but the chat has some factual errors (the film was shot in 1963 not 1961 and despite Bothelo's assertions it was directed by Sidney Salkow with no real involvement from the mysterious Ubaldo Ragona). Bothelo has a halting delivery that is also sometimes difficult to listen to. 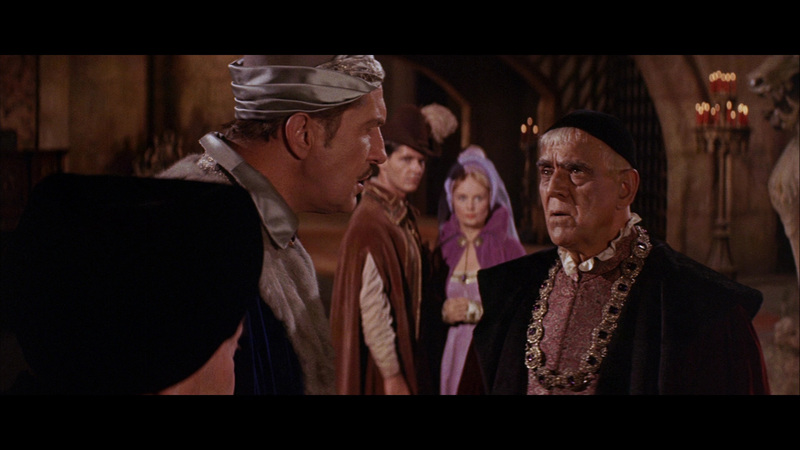 The talent oriented commentaries include Roger Corman. He has his commentary from the LIGEA dvd ported over and this is a typically good Corman track. The man has an extremely laid back delivery, but his soothing voice and plethora of information make a perfect combination. Del Valle returns for one of the sets highlights with a great chat with actor Halsey for THE RETURN OF THE FLY. This is exactly the kind of environment that Del Valle shines in - a one on one with a friendly star that has a great memory. Halsey and Del Valle have great chemistry and cover a lot of ground. Probably the most "fun" commentary in the set. Actress Elizabeth Shepherd is moderated by Roy Frumkes for a commentary on LIGEA and she's both personable and informative as well as enthusiastic. She has kind words for her co-stars and some nice stories. A worthwhile listen. Three "Richard Matheson Storyteller" segments are ported over from the DVDs for THE RAVEN, THE LAST MAN ON EARTH and THE COMEDY OF TERRORS and these interesting pieces are a little over 5 minutes each where the late author goes over a bit of what he was trying to accomplish in the films. Matheson's comments on LAST MAN ON EARTH are less then enthusiastic which isn't much of a shock. "Corman's Comedy Of Poe" has a similar setup with producer Corman in the hot seat instead of Matheson discussing THE RAVEN. Also included for THE RAVEN is an odd promotional audio recording done for an LP of Karloff and Paul Frees. The meatiest extras reside on the final disc. 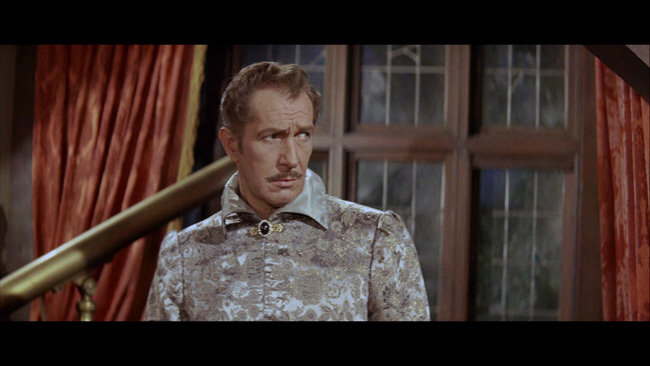 "Vincent Price: Renaissance Man is an almost half hour retrospective that manages to cover some of the interesting details of Vincent's stage career in addition to his film work. "The Art Of Fear" and "Working With Vincent Price" are featurettes that focus on how Vincent came to be involved in specific projects and his co-stars respectively. One of the nicest features on this box set is the inclusion of Vincent Price's intro and outro segments that he recorded for PBS in the 1980's for THE RAVEN, THE COMEDY OF TERRORS and THE TOMB OF LIGEA. This also lead to a featurette on this set called "Introductory Price: Undertaking the Vincent Price Gothic Horror" where PBS executive Duane Huey talks about Price and he came to do the segments. This is an offbeat and interesting extra. All of the films except THE LAST MAN ON EARTH have their respective trailers included in HD as well as still galleries. RETURN OF THE FLY also has a TV spot included. I'm tempted to just yell BUY IT in all caps and call it a day but here here is the pitch in a bit more depth. Scream have served up a wonderful set featuring some of Price's more interesting efforts and welcome upgrades for some of his titles with a history of subpar releases. Audio and video quality is very good overall. There are some lovely new extras and a nice selection of previous ones. 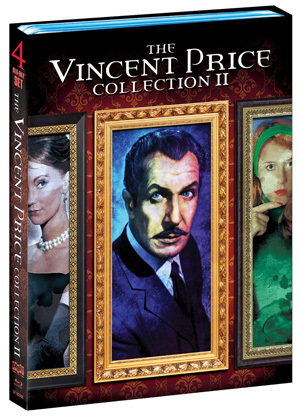 This is an essential purchase for Vincent Price fans. Woohoo! This is going to hit my doorstep next week, thanks for the caps!